Home » Concrete » Precast & Prestressed » Building Systems » Stadiums and Arenas » Building a Stadium or Arena? Precast has become the preferred choice for arenas & recreational facilities because of durability and ease of maintenance. Seating risers are often combined with other precast components such as stairs, columns, beams and exterior wall panels for complete facility packages. Prestressing Precast concrete segments has allowed this versatile material to form complex components of a stadium such as cantilever arms and ring beam construction to support the roofs of these structures. Precast Concrete is also commonly used for cantilevered raker beams, plus standard beams and columns which carry the seating and provide unobstructed viewing of the playing surface. Mass Stadium seating units have been manufactured in a variety of configurations and spans to provide for quick installation and long lasting service. Strescore plank has been used for Pedestrian ramps, thoroughfares, concession, toilet, and dressing room areas. 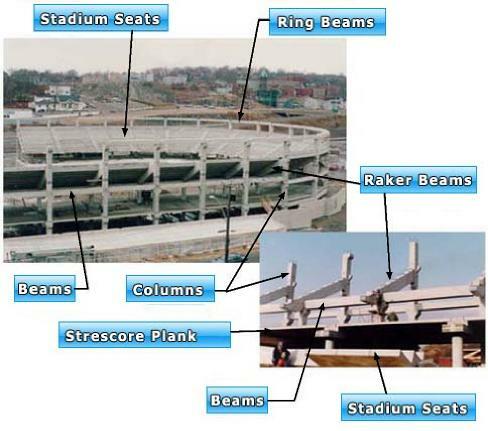 A wide range of precast prestressed concrete elements can be utilized in the design and construction of your next stadium / arena project.